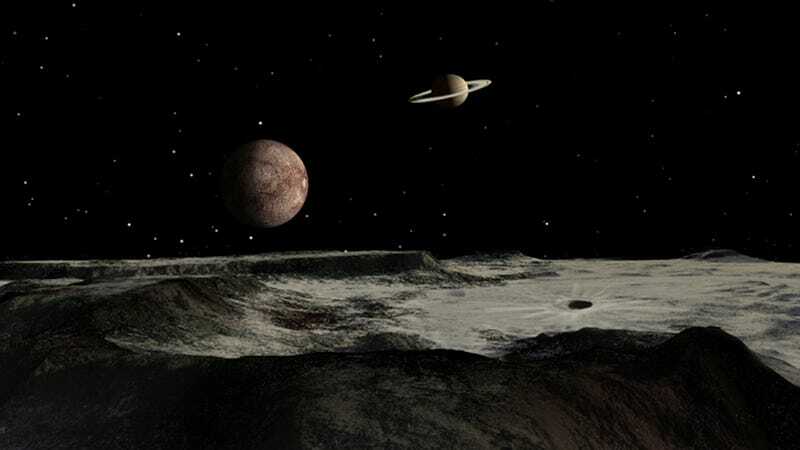 One of the weirdest of the solar system's moons is Iapetus. This is a medium-sized (1,471 km (914 miles) satellite of Saturn, orbiting about 3,561,300 km (2,213,000 miles) from the planet. Seen from the surface of Iapetus, Saturn looms about four times larger than a full Moon in Earth's sky. Ever since its discovery by Cassini in 1671, something seemed strange about Iapetus. For one thing, it changed brightness as it orbited Saturn. The only explanation anyone could think of was that, for some unknown reason, Iapetus is brighter on one side than the other. And that turned out to be fairly close to the truth. In fact, one side is almost as dark as coal while the other is almost as white as snow or ice. When the dark side is facing Earth, the satellite appears dim. When the light side faces us, Iapetus brightens up. The first space probes to fly by Iapetus revealed a moon that looked almost exactly like the traditional yin-yang symbol. An S-shaped curve separated the satellite into two distinct zones, one dark and one light. Why this should be so is really something of a mystery, for which there are several possible answers. One is that dark material shed by the outer moon, Phoebe, spirals in and is swept up by the leading hemisphere of Iapetus. Another is that the dark material might have been deposited by volcano-like eruptions of hydrocarbons. But even this two-toned paint job isn't the weirdest thing about Iapetus. That's reserved for its equatorial mountain range. There's nothing else like it in the solar system. Running almost completely around the satellite like a belt, range makes Iapetus look as though someone slammed the two halves the moon together and the glue oozed out. Some astronomers think the ridge was formed at a time in the distant past when Iapetus rotated much faster. Another possibility is that the range was created by the collapse of a ring. A similar idea was recently proposed by William B. McKinnon of Washington University and Andrew Dombard of the University of Illinois Chicago. Their idea is that Iapetus once had a satellite of its own. As it drifted close to Iapetus, the moon was torn apart by tidal forces. The debris formed a ring that eventually fell onto the moon's equator, building up the mountain range as it did so. "Imagine all of these particles coming down horizontally across the equatorial surface at about 400 meters per second," says McKinnon, "The speed of a rifle bullet, one after the other, like frozen baseballs." While a picture of the apocalyptic descent of Iapetus' ring is still in the future, I imagined what its ancient satellite might look like, sharing the sky with Saturn, and what it might be like to see two ringed worlds in the sky at the same time. I also wondered what the mountain range might look like to explorers clambering around among its rugged foothills, its peaks stretching railroad-straight over the horizon. The results are the accompanying illustrations here (click any to enlarge). Ron Miller is a science artist. You can see more of his work on his website.